Is 2012 The Armageddon for the Two Party System? WAKE UP AMERICA we don’t pick our candidates the media does! Look, it’s not my fault the Republican Party shot itself in the foot with their nomination of the abortion profiteer, Mitt Romney, so stop telling me that my vote doesn’t matter if it goes to the third-party. Telling me that my vote for Ron Paul or Gary Johnson is a ‘vote for Obama’ is ridiculous. That would be like me telling an Obama supporter that their vote is a vote for Mitt Romney! My vote for Ron Paul or Gary Johnson is just that a vote for Ron Paul or Gary Johnson. I don’t know what the other ten million unhappy Ron Paul supporters are going to do in November I only know that I am the only person that I have control over. I have free will and I will vote for whomever I want to vote for in November. I not pledge my allegiance to any cult and I will not vote for Mitt Romney! 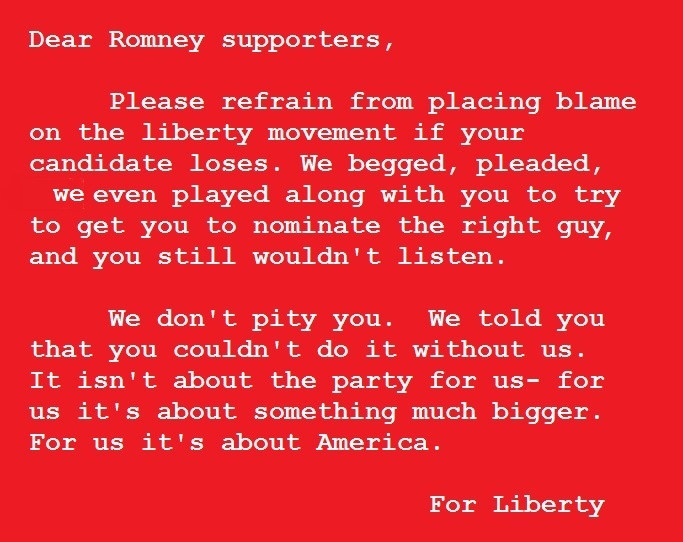 Bottom line is this: Don’t blame the liberty movement for your party picking such a weak candidate. If the Republican Party loses to Obama this November it will be because they picked the weakest candidate to run against Obama and if he wins it will only because people believe that he can do a better job than Obama. If by some miracle American’s woke up and recognized that there is a third-party option and voted in that way that it’s what I think would be in the best interest of our future. We can either keep going on with the same agenda that the two-party élite have had for us the last 100 years or we can try something new- like freedom. There is nothing special about Mitt Romney. If he gets in office he is going to continue on the same path that all the presidents have traveled my entire life! It is not our fault that the Republicans picked the weakest candidate to run against President Obama. Even the democrats on TV knew that Romney was the weakest candidate that the party could pick! If there is anyone to “blame” it should be the media! They refused to report on our candidate! They have misreported his entire election and literally told Ron Paul that “it wasn’t going to happen” in 2008. The power élite do not want someone like Ron Paul in office. They are afraid they will lose their power and control and if you think that they should lose their power and control then I urge you to be libertarian for just one day. I do want to thank Ron Paul. He motivated me to get involved in the Republican Party and in Iowa Ron Paul won the majority of the delegates that were sent to the Republican National Convention through a transparent process that lasted around 6 months. It takes at least six months to work through the process to get anyone nominated through the two-party system for President of the United States in Iowa but the friendships and bonds are formed over years. Those who dismiss the two-party system and it’s process are the same people who complain about the poor choices that those of us that do take part in the process make! The only way to get someone nominated in either party is to be involved on the local level and carry through with the process all the way to the convention. In my experience it does make a difference and it does work. There is a lot of frustrations and disagreements throughout the process but if you are passionate about politics you will find the experience quite fulfilling. You might even sleep better at night knowing that you were an influence in who was chosen to be the nominee. The states that nominated the ‘other evil’ yesterday at the RNC sent me two messages. First message was that they are not safe places to live and secondly they watch a lot of television for their information. Essentially they are psychological slaves brainwashed by the media propaganda. There just aren’t enough critical thinkers like Ron Paul in the world. Bottom line is he needed more supporters to be involved throughout the entire process and they needed be able to commit to the process in order secure our candidates nomination. If there were only more ethical people involved and dedicated throughout the nomination process the rules of the game might not have been changed last night and today things might have turned out differently. The process does work but it brings out the best and worst in every person involved. Presidential politics is a process that many people take seriously. Sometimes too seriously! Romney worshipers must be afraid because many of them have been very critical of the Ron Paul Republicans. So much so that I don’t know if there is anyway to “repair the harm” or to “regain our trust” to “win us over” to vote for their candidate. Threats and coercion tactics seem to be the norm in both the parties. I will not volunteer for the Romney campaign. I feel that it is a counterproductive effort. The lack of respect that was shown to my candidate through the nominating process outraged me and turned me off to party politics. I mean I support most of the candidates on the republican ticket, locally, I just don’t support Mitt Romney. I don’t know if I can trust anyone who does. Now that the republican made their bed they are going to have to sleep in it. Will you fall for the lie that your vote is a vote for Obama if you vote in the third-party? Are you in it for the sake of “beating Obama” or “saving the party”? I would rather “throw my vote” away on a third-party candidate or write Ron Paul in for president than sacrifice my principles to save America! I want people to stop telling me this! I think that if there were any year for a third-party 2012 would be that year. I confess, I did not listen to Ann speak and I won’t. She doesn’t appeal to me. She could never relate to me or women I know like me. She is not an “average American woman” Ann doesn’t know what it is like to live in America as an average woman. She has had her life handed to her on a silver platter! Her speech means nothing to me! Ann Romney means nothing to me! Mitt Romney means nothing to me! What’s important to me? My liberty. I would rather support a third party candidate who is for the cause of liberty than either one of the candidates picked by the mainstream media! Their plan (Obama or Romney) is to hand over our sovereignty to the United Nations to destroy our Constitution to make way for the “New World Order” or “One World Government”. I am not in favor of a one world government or a one world currency. I am not in favor of our country having military bases all over the world in the name of “defense” or “liberty”. I think there is something to Ron Paul’s “blow-back” theory and that we should stop while we’re ahead! What would happen if China were to bring one of their bases here to America? How would American’s like that? They wouldn’t! So why American’s are surprised that the world hates us and wants to attack us because we have a military presence in their countries is beyond me. All I know is America is not free. Our republic has been hijacked and we don’t have much time to save it. We must rid ourselves from the corrupt élite who have destroyed the American middle class in pursuit of this one world government! 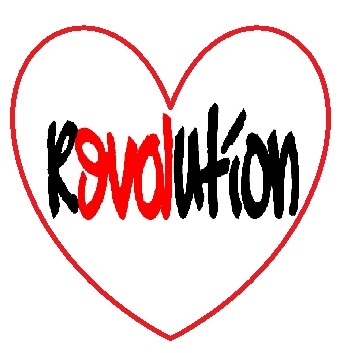 The revolution has just begun!